Loatheb was added in the Curse of Naxxramas Adventure. He is available from Wing 2 - The Plague Quarter which opened on July 29th, 2014, and is obtained after defeating the adventure boss Loatheb. Need help conquering the Curse of Naxxramas Adventure to obtain Loatheb? Head on over to our Curse of Naxxramas Adventure Guide! Naxx expansion cards are the bomb. It is beyond me why Loatheb isn't an elemental while Ixlid, Fungal Lord is. They're literally the same species! Was already changed with the last patch. Ixlid is no longer an elemental. I have a feeling next year a few Wild cards will be rotated into Classic since with each new Hall of Fame rotation, there will need to be replacements for cards to keep the game fresh. as a rogue player i am happy you are gone. guys should i craft loatheb or other wild cards(including blackrock), or wait for ungoro to use my dust? I miss Loatheb, oh so much. Funnily enough, Loatheb interacts with Emperor Thaurissan's cost reduction below 0. If a Shiv gets its cost reduced four times 2-4=-2+5=3 it only ends up costing 3 mana, instead of 5. Still waiting Blizzard's announcement moving him to the Basic set..
As a player who only plays wild but didn't have the chance to get naxx, should I craft this? I crafted Boom, so I'd guess I should make this next. One of the best cards ever introduced. It was fairly situational but if you played it in the right situations you would decide the game on the spot. Unfortunatly Blizzard mostly stepped away from printing cards which required a bit of judgement and skill. They dont want people to have answers, they want "tempo". Sadly this is true. 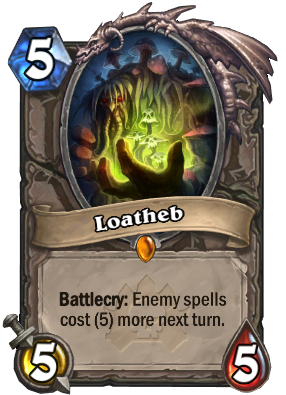 Loatheb was one of the best card introduced, gave the game more depth. Now it's tempo tempo tempo and SMOrc. We don't need more tempo, we need more cards like this and Zombie Chow. Situational, but powerful. Yes, this is a card you need to play with strategy and skills. I hate the cards that will surely give you advantage whenever you play it like Kazakus and Reno. I don't mind them too much actually. Reno is just a product of the constant tempo and smorc meta. He needed to be powerful in order to be a real answer to aggression. I am still unsure about Kazakus. It is powerful for sure but with reno gone it will probably not be able to sustain the highlander deck type on its own.